The aerial shot of the Auramar Beach Resort says it best. 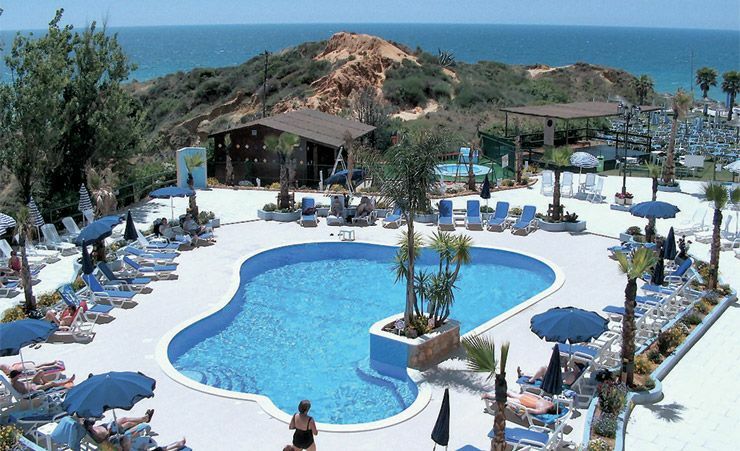 Here is a beautifully positioned hotel in a stunning location on the Algarve headland looking out to sea. So no wonder the Auramar Beach Resort is such a popular choice for holidaymakers to the Algarve. 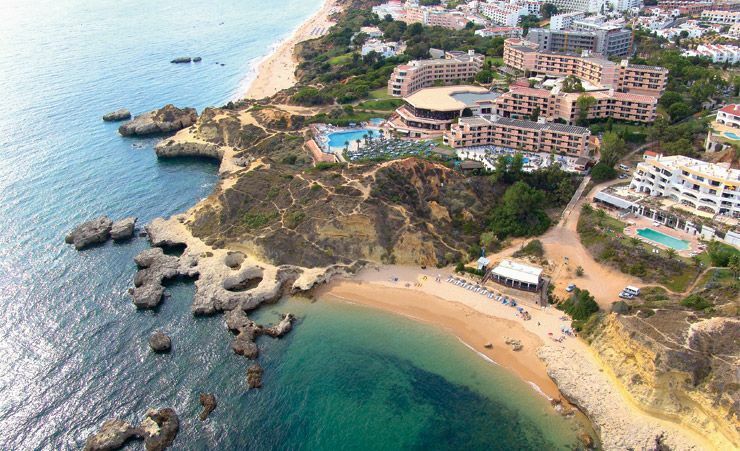 Here is a hotel that gives you those unparalleled views, and the opportunity to make the most of the wonderful beach for which the Algarve is famous, but also puts you within easy reach of Albufeira and all its amenities. As if there wasn't already enough to recommend it, the Auramar Beach Resort provides all-inclusive accommodation, making the stay as comfortable as the views are spectacular. You certainly won't have to worry about where to eat each day. Your buffet breakfast, lunch and dinner are all included, as well as snacks, soft drinks, tea and coffee; even local alcoholic drinks come gratis as part of the package. 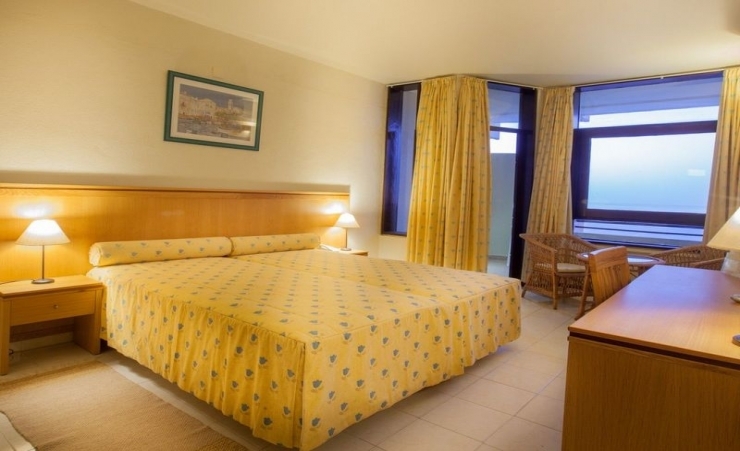 All the twin / double rooms are air-conditioned and come with private bathrooms and balcony. 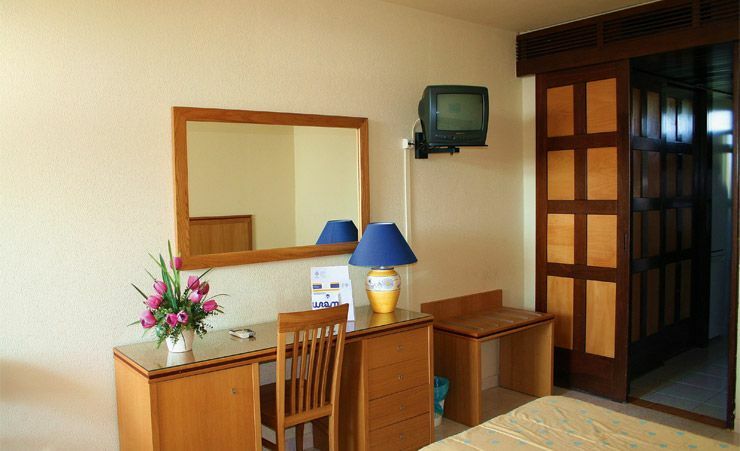 Rooms are kitted out with satellite TV (4 UK channels), fridge and a room safe. Irons and hairdryers are also available on request. Sea View rooms are available, you must book a superior room or pay locally for an upgrade if there is availability. There is a whole world of entertainment waiting for you at the Auramar Beach Resort too. With two exceptional swimming pools, children's pools and a heated indoor pool, you can enjoy a variety of swimming experiences inside, outside and in the sea. With a sauna and relaxing massage service also available in-house you can ease away any lingering tiredness if you've swum a few too many lengths. There are plenty of activities to enjoy on dry land too: ranging from billiards to tennis, and featuring a mini golf tournament every summer. All of that and the beach on your doorstep too! For a quintessential Algarve holiday, try the Auramar Beach Resort. 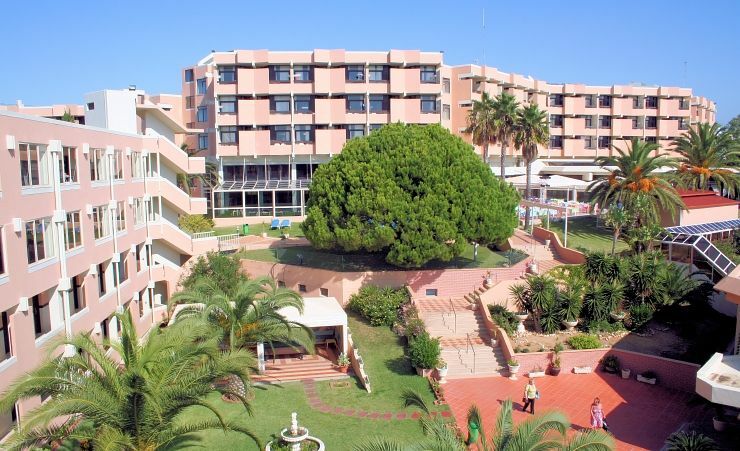 Close enough to Albufeira and all its amenities, but pleasantly secluded, the hotel is the perfect holiday spot. And you'll never forget those views! Buffet breakfast, lunch & dinner; snacks; unlimited local soft drinks, water, local alcoholic drinks & tea & coffee. (Time & measurement stipulations may apply). Please note the package given is a guide and the full description will be given at the time of arrival. Find out more about your accommodation and the in room facilities at the Auramar Beach Resort . 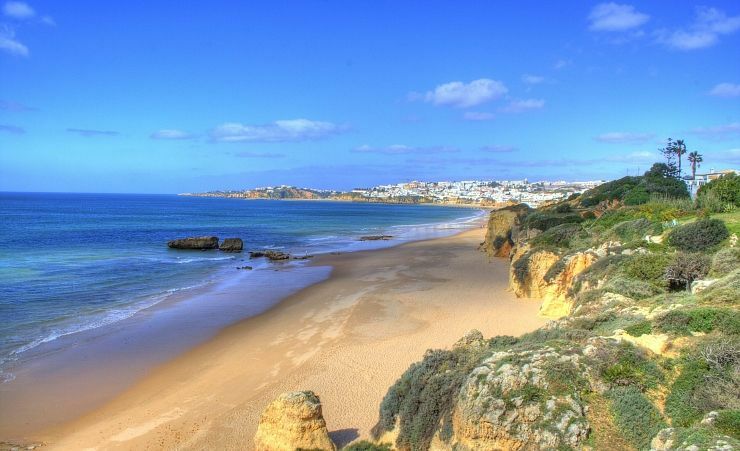 Albufeira is the most popular of the Algarve resorts, it is a vibrant and exciting holiday destination. Dotted with more than 25 golf courses, it is a golfers dream! Beautiful beaches, excellent shopping and a fantastic choice of restaurants and bars are also on offer. Much of Albufeira is now pedestrianised and leads to the sandy beach. No supplements for single travellers in Twin rooms. Transfer Time: approximately 35 minutes. This is my 3rd holiday to this hotel at The Auramar, because I like the position near the beach, and that the self service buffet, gives a marvellous choice, plus the friendly helpful staff, ar e the icing on the cake. I have great respect for Mercury/Sunspot, and have had, now 4 holidays with your company, and have enjoyed each one. Your choice of hotels, and utilising low cost Airlines, does keep the cost down, which is appreciated. Very friendly staff. Entertainment each evening. Buffet style meals with a good selection. 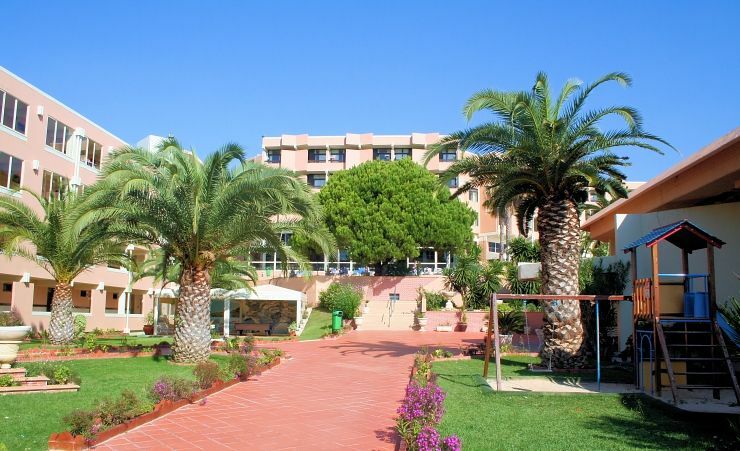 Daily activities at the hotel including archery, walks and tennis. Indoor swimming pool. Hotel is near to The Strip which has many bars which are opened in the summer and most closed at the moment. Twenty minute walk along the beach to the old town. Lovely friendly and efficient service. Exceptional views to wake to everyday.Catered for all varieties of choices. Many selections to choose. Good Hotel coach service to town 3 times daily. 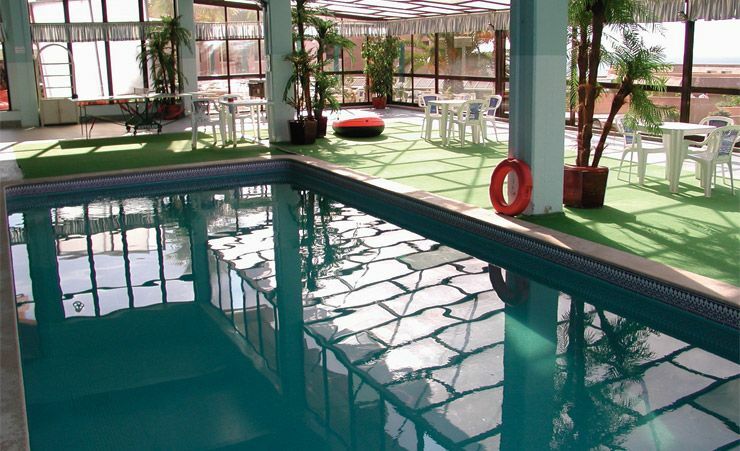 Good Indoor / Outdoor pools, Poolside Restaurant, Gym, Dancing Bar. Excellent value and a great holiday. Great value for money, Farah at time of booking was very helpful. Beautiful location. Restaurant staff excellent. Housekeeping basic. Ideally located just yards from the beach. Everything available on sight. Not a resort for the disabled as there are many steps and local walks are hilly. Staff are friendly and very accommodating. We are very likely to return again. Hotel facilities excellent. Close to amazing beach, lovely pools on site. Entertainment every night. Staff very good all over the Hotel. Would stay again. Facilities were good, staff service faultless, pools and pool area very good but room in need of a little updating. However, referbs in progress overall good value for money. Tried and tested formula - fantastic location - weather great. This was a very good hotel with extremely helpful and friendly staff who could always be found when required. Lovely hotel in all respects and the shuttle service to town is very good. VERY PLEASED WITH THE ROOM WHICH HAD A SPLENDID VIEW OF THE SEA WHICH WE HAD REQUESTED, ALSO A TOP FLOOR APARTMENT. lovely holiday. Auramar good value, good location good all-round. Excellent value for money and an enjoyable holiday. There have been improvements in general cleanlness and dinning room presentation since my last visit 3 years ago. The food and its storage has greatly improved as I noted regular checks of the temperaure of the hot food displayed in the buffet.All of the staff were excellent.